A view of the Amundsen-Scott Station in 2009. In the foreground is "Destination Alpha", one of the two main entrances. The main entrance to the former geodesic dome ramps down from the surface level. The base of the dome base was originally at the surface level of the ice cap, but the base had been slowly buried by snow and ice. 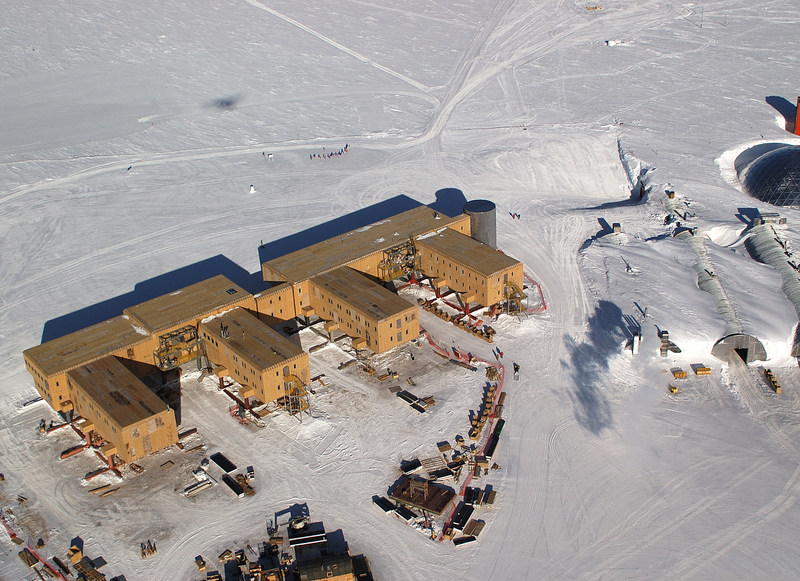 An aerial view of the Amundsen-Scott Station in January 2005. The older domed station is visible on the right-hand side of this photo. The Amundsen–Scott South Pole Station is the American scientific research station on the high plateau of Antarctica. This station is located at the southernmost place on the Earth, the Geographic South Pole, at an elevation of 2,835 meters (9301 feet) above sea level. 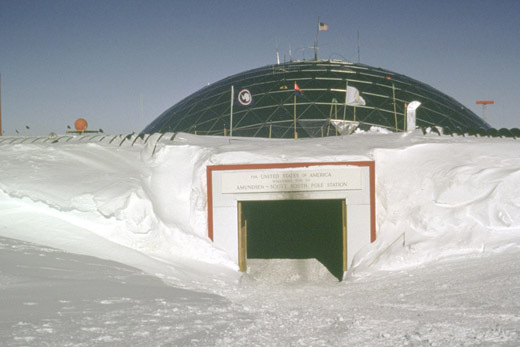 The original Amundsen-Scott Station was built by the United States Government during November 1956 as a part of its commitment to the scientific goals of the International Geophysical Year (I.G.Y. ), an international effort lasting from January 1957 through June 1958 to study, among other things, the geophysics of the polar regions. Before November 1956, there was no permanent human structure at the South Pole, and very little human presence in the interior of Antarctica at all. The few scientific stations in Antarctica were located on and near its seacoast. The station has been continuously occupied by people since it was built. The Amundsen-Scott Station has been rebuilt, demolished, expanded, and upgraded several times since 1956. Since the Amundsen-Scott Station is located at the South Pole, it is at the only place on the land surface of the Earth where the sun is continuously up for six months and then continuously down for six months. (The only other such place is at the North Pole, on the sea ice in the middle of the Arctic Ocean.) Thus, during each year, this station experiences one extremely-long "day" and one extremely-long "night". During the six-month "day", the angle of elevation of the Sun above the horizon varies continuously. The sun rises on the vernal equinox, reaches its maximum angle above the horizon on the summer solstice in the Southern Hemisphere, around 20 December, and sets on the autumnal equinox. During the six-month "night", it gets extremely cold at the South Pole, with air temperatures sometimes dropping below −73 °C (−100 °F). This is also the time of the year when blizzards, sometimes with gale-force winds, strike the Amundsen-Scott Station. The continuous period of darkness and dry atmosphere make the station an excellent place from which to make astronomical observations. The number of scientific researchers and members of the support staff housed at the Amundsen-Scott Station has always varied seasonally, with a peak population during the summer operational season, which lasts from October to February. In recent years the wintertime population has been around 50 people. 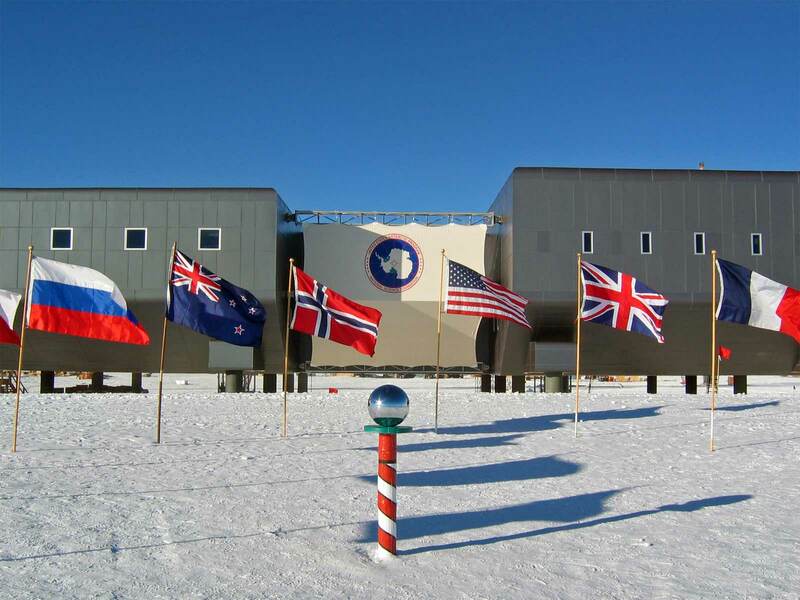 The Amundsen–Scott South Pole Scientific Station is the (only possible) southernmost continually inhabited place on Earth. Its name honors Roald Amundsen whose Norwegian expedition reached the South Pole in December 1911, and Robert F. Scott whose British expedition of five men reached the South Pole about one month later (in January 1912). All five men in Scott's expedition perished during the journey back towards the coast. Everyone in Amundsen's expedition returned safely to their base on the seacoast of the continent. The original Amundsen–Scott Scientific Station was constructed during November of 1956 to carry out part of the International Geophysical Year (I.G.Y.) of scientific observations during 1957 through 1958, and the station has been continuously occupied since then - except for the rare exceptions when everyone was outdoors. 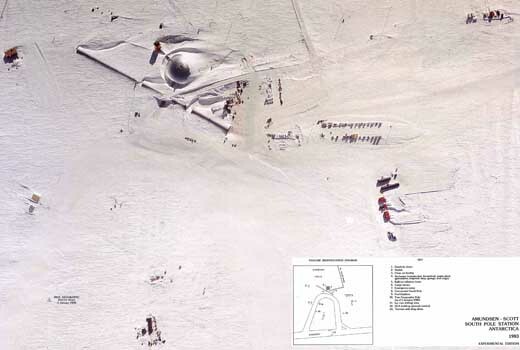 This station currently lies within 100 meters (330 ft) of the Geographic South Pole. Because this station is located on a moving glacier, this station is currently being carried towards the South Pole at a rate of about 10 meters (or yards) per year. 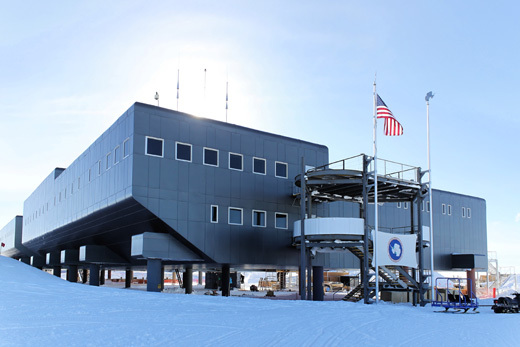 Although the United States Government has continuously maintained an installation at the South Pole since 1957, the central berthing, galley, and communications units have been constructed and relocated several times. Each of the installations containing these central units has been named the Amundsen–Scott South Pole Station. Snow accumulation is about 60–80 millimeters (water equivalent) per year (3 in/yr). The station stands at an elevation of 2,835 meters (9,301 ft) on the interior of Antarctica's nearly featureless ice sheet, which is about 2,850 meters (9,350 ft) thick at that location. The recorded temperature has varied between −13.6 °C (7.5 °F) and −82.8 °C (−117 °F), with an annual mean of −49 °C (−56 °F); monthly mean temperatures vary from −28 °C (−18 °F) in December to −60 °C (−76 °F) in July. The average wind speed is 5.5 m/s (12 mph); the peak gust recorded was 25 m/s (55 mph). The last standing section of the old dome. That dome was dismantled during the "summer" season of 2009-10. The station was relocated and rebuilt in 1975 as a geodesic dome 50 meters (164 ft) wide and 16 meters (52 ft) high, with 14×24 m (46x79 ft) steel archways, modular buildings, fuel bladders, and equipment. Detached buildings within the dome housed instruments for monitoring the upper and lower atmosphere and for numerous and complex projects in astronomy and astrophysics. The station also included the skylab, a box-shaped tower slightly taller than the dome at the 10:30 position to the dome in the picture to the right. Skylab was connected to the Dome by a tunnel. The Skylab housed atmospheric sensor equipment and later a music room. Design of the building started in 1992. The design was a 7,400 m (80,000 sq ft), 2-story building that cost $150 million. The facility was officially dedicated on Jan. 12, 2008 with a ceremony that included the de-commissioning of the old Dome station. The ceremony was attended by a number of dignitaries flown in specifically for the day, including National Science Foundation Director Arden Bement, scientist Susan Solomon and other government officials. During the summer the station population is typically over 200. Most personnel leave by the middle of February, leaving several dozen (47 in 2010) "winter-overs", mostly support staff plus a few scientists, who keep the station functional through the months of Antarctic night. The winter personnel are isolated between mid-February and late October. Wintering-over offers notorious dangers and stresses, as the station population is almost totally isolated. The station is completely self-sufficient during the winter, and powered by three generators running on JP-8 jet fuel. 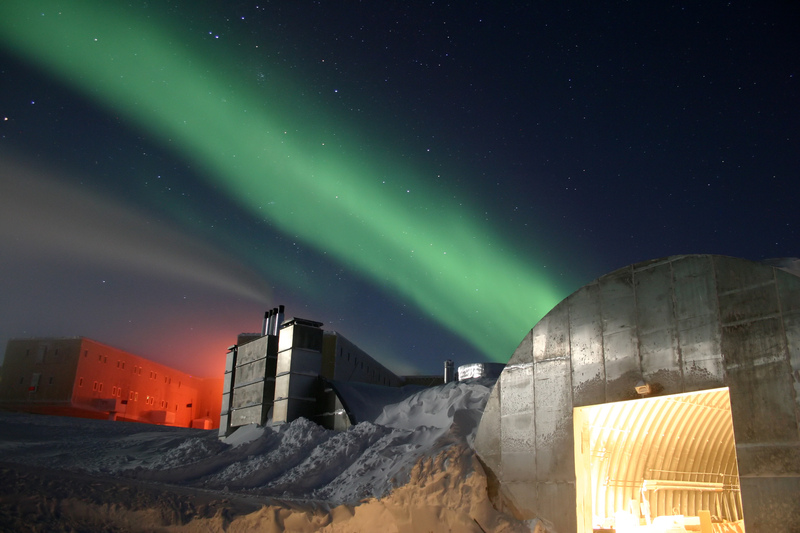 Research at the station includes glaciology, geophysics, meteorology, upper atmosphere physics, astronomy, astrophysics, and biomedical studies. 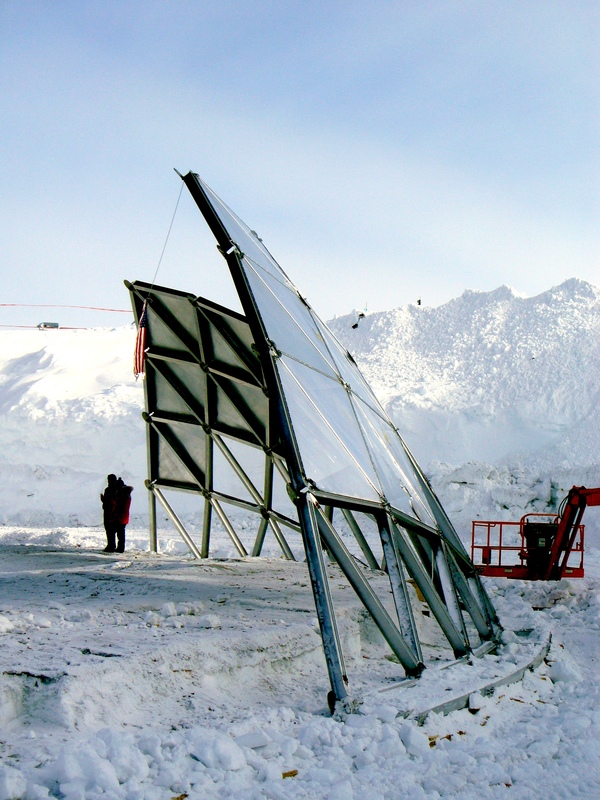 In recent years, most of the summer scientists have worked for the IceCube Neutrino Observatory or for low-frequency astronomy experiments such as the South Pole Telescope and BICEP2. The low temperature and low moisture content of the polar air, combined with the altitude of over 2743 m (9,000 ft), causes the air to be far more transparent on some frequencies than is typical elsewhere, and the months of darkness permit sensitive equipment to run constantly. In January 2007 the station was visited by a group of high Russian officials, including FSB chiefs Nikolay Patrushev and Vladimir Pronichev. The expedition, led by polar explorer Artur Chilingarov, started from Chile on two Mi-8 helicopters and landed on South Pole. The BBC program On Thin Ice covered the participation of two-time British Olympic gold medalist James Cracknell, television host Ben Fogle and Dr. Ed Coates in the first organised race to the South Pole since Amundsen beat Scott. 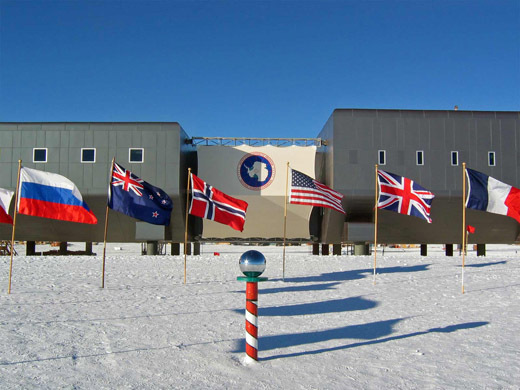 The final episode of the five part series showed the three arriving at the "Ceremonial South Pole", with the Amundsen–Scott Station in the background. The three finished second, twenty hours behind a two-man team from Norway. CNTR (9032 11256 5726 SSB), ALTN(4770 7995 11553 SSB) (4718x 13251x SSB) (6835x AM voice) Grd freq cont dur opr season, nml 15 Oct to 25 Feb annually. MISC (2182 As rqr) (4123 USAP). CAUTION Skiways prepared for USAP acft only - ALL OTHERS USE AT OWN RISK. Prior arng rqrfor Austral win use; (see FLIP PLANNING AP/3). For addn info call C-1-843-218-5316/5757. Dimensions may change wo ntc. MISC No hgr space avbl. Skiway 02G mrk with 3' x 3' black panels at 400' intervals for the len of skiway. Lcl std time equivalent to NZ lcl std time. 6(NGH heaters). RSTD LC-130 acft shall not drift cargo or combat offload for trng. LC-130 cargo drifting rqr prior apvl fr stn mgr or United States Antarctic Program (USAP) afld mgrprior to dep to South Pole.